DSLRs weren't designed with video in mind, and the best results are typically only obtained when the right accessories are used. An appropriate support is recommended for both convenient operation and steady footage, while an external microphone will provide superior sound quality to the camera's built-in alternative. Naturally, you need to pay for both, and for most casual users these options either won't be practical or will simply cost too much. Small, cheap alternatives are therefore high in demand, and the Micromuff presents an affordable and clever solution to the issue of wind noise. Essentially a small, fluffy windshield, the Micromuff sits over a camera's microphone and claims to eliminate the battering wind noises which are all too easily picked up by in-camera microphones. 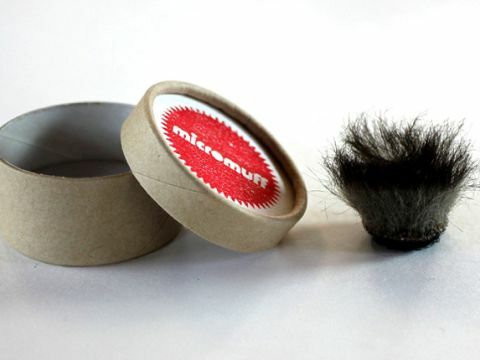 The Micromuff comes with a small adhesive Velcro ring, which goes over the camera's microphone holes, as well as a small cardboard storage case. It looks a little strange when mounted on the camera, but it's easily removed when not required and takes up practically no storage space when not in use. In use, the Micromuff does manage to filter out the most obvious wind noise, which in turn means that all other sounds are rendered with slightly greater clarity. It doesn't quite eliminate them completely, though, and after a few uses the Velcro began to lose its adhesiveness, which creates a looser gap between the Micromuff and the Velcro ring. Ultimately, it's a clever idea and does have some effect, but it's not quite the ultimate solution to the problem it attempts to solve.